Strike a Pose Films.com » Happy Belated Birthday Sam Anderson! 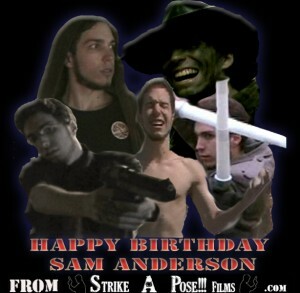 Happy Belated Birthday Sam Anderson! It’s only a couple of days late! It’s still good, it’s still GOOD TIMES! Sam Anderson, the original co-creator of STRIKE A POSE!!! Films, just celebrated his 25th Birthday, and thankfully I got to travel down to the faraway land of Harrisonburg, VA, to watch some of our old movies and of course, our inspiration, Sockbaby, with the original Chin-Strap himself. He is also the living embodiment of “GOOD TIMES!” And, as always, this has lead us to creating Sam’s own Cast and Crew page! Sam was there LITERALLY AT THE BEGINNING. I can remember sitting in his house with him (or something, but to be visual we’ll use that) trying to come up with something to do with my first video camera, the ol’ Canon Elura 90 (R.I.P.). 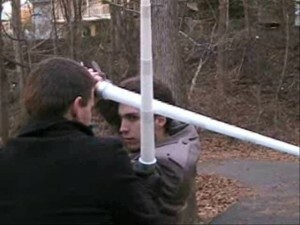 To convince him and his friends Stuart DeMattia and Bob Novich to join in, I simply told him “we’re going to go into your back yard and film you guys hitting each other with lightsabers.” When it comes to amateur film making, Star Wars always works to bait amateur actors. Thus, the first official Strike a Pose!!! Film, The Third Path, was born. Sam went on to star in many of our projects, including Joe Belivitz in Car Trouble, Clarity, Line of Sight, and the biggest SAP production still unreleased, CURSE OF BODANGOFISH. And THAT was an adventure in film making! 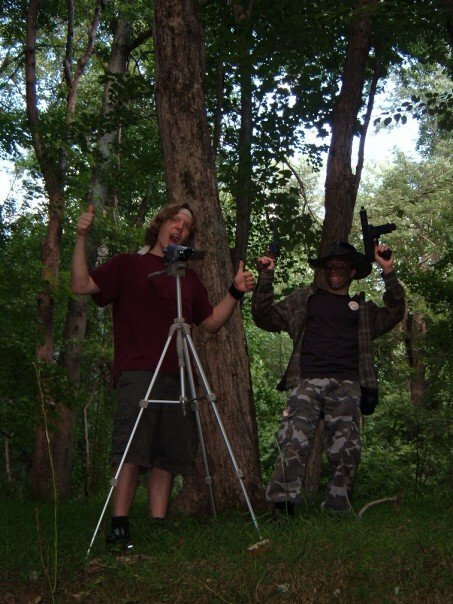 Sam has been one of my best buds and was always helpful in my projects, creating music that was used in Gull Man: Defender of Salisbury, and even making his own short for one of his college classes, CODEBREAKERS, a great little educational short about MATH. Anywho, Sam, thank you for being the most excellent, and most Bondangoiest, friend in the world! Without you, STRIKE A POSE!!! Films wouldn’t be what it has been and will someday be again!